Indian restaurants are extremely common in the UK, with the vast majority of them offering identikit versions of the same familiar dishes tailored to the British palate. Sri Lankan food, however, is far less represented – and this simple no-frills canteen hidden in amongst a non-descript row of shops near Lewisham is one of my favourite places to get a spice fix. Sri Lankan food is fantastic if you’re a vegetarian – select from a colourful daily selection of curries and dahls on display to have with rice. The meat and fish-based curries vary day by day too, and what’s great is you can mix and match them with the veggie options. 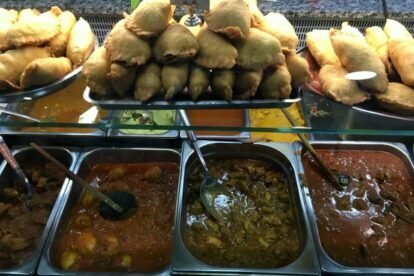 The snacks and starters on offer are perfect as a starter or a spicy little bite to fill a gap, consisting of small patties, mutton and veg rolls, onion bahjis and more. Also, I’d highly recommend the Kothu – a Sri Lankan classic street food dish not often found in London – it’s chopped up roti stir fried up with onions, veggies and mutton. Ask for it spicy and you get it laced plenty with green chilies so be warned – it’s not for the faint-hearted!